People generally look to the more potent spirits for cigar pairings, but, in my experience, a good beer can be an excellent accompaniment to a handmade stogie. And by good beer I mean a well-crafted, flavorful brew, not that watery stuff that is constantly advertised during televised sporting events. Now don’t get me wrong. I’ve had more than my share of Bud, Miller, Natural Light, and PBR…And many times with a cigar. However, when I want a beer that actually adds to my smoking experience, I turn to something a little better. And one of the most dependable makers of excellent flavorful beer is Sam Adams. The Sam Adams Boston Lager is the flagship beer of the line. It is a hoppy brew with little in common with the traditional, watered-down lagers I mentioned earlier. Amber in color and aromatic in scent, it has a nice bite. It also is the easiest Sam Adams beer to find – available on tap in most bars and many restaurants. I would suggest pairing it with a medium-bodied cigar with a little spice, perhaps something with a Cameroon wrapper. The Black Lager is not one of my favorites. While very smooth, I found the chocolate flavors and grainy finish a bit unpleasant. Still, I know beer lovers who think this beverage is the best made by Sam Adams – so I think this is sort of a love it or hate it brew. If you’re having a pint of the Black Lager with a cigar, you’ll want something that accentuates the chocolate flavors. Try a full-flavored maduro like a CAO Brazilia, a Padron Anniversary (Maduro), or a La Gloria Cubana Serie R.
The Sam Adams Boston Ale is a classic copper-colored American ale. Crisp, fruity, and well-carbonated, it is a lighter-bodied brew. The Boston Ale is very drinkable and versatile enough to be enjoyed with a meal, or just with a few more Boston Ales. It also is can be enjoyed year round. Pair this beer with a mild, creamy cigar like a Macanudo Natural, a Davidoff Grand Cru, or an Ashton Classic. 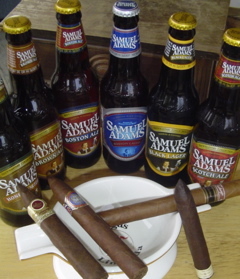 Now let me know your favorite Sam Adams beers (and the cigars you suggest they be paired with) in the comments. The Octoberfest is my favorite. unfortunately it is only available for about 1 month a year. This article is a pretty cool idea. Kudos on coming up with it. My favorite Sam Adams is by far the Honey Porter. It's an excellent brew followed a close second by the Black Lager. I really enjoy a Tatuaje Cojonu 2003 with my Honey Porter. Octoberfest for me is the best followed by the Summer Ale. For Octoberfest a nice Rocky Patel Sun Grown or Torano Exodus 1950 goes perfectly. For the Summer Ale something light to go with the Lemony taste. Perhaps something from the Drew Estate Natural Line or an AVO. I really enjoy the Winter Ale by Sam Adams. But, it's about as difficult to find as the Octoberfest. I'm agree with you that the Winter Ale is a great beer. When I was in college, in the spring, when the Winter Ale was no longer available most places, one store near my school used to sell cases (24) of it for $13. I'd always go scoop 3 or 4 up so I could have some nice beer to drink on my college budget. Blue Moon with an orange wedge is really nice with a Montecristo White. I just had that combo last weekend and it was a winner. Summer Ale is my favorite, an unfiltered wheat ale similar to blue moon, but substitute the orange for a lemon. Oktoberfest is excellent. Black lager is a good choice. I've had a Fezzywig a few times as well, it is as dark as the Winter lager but with more spice. The Winter Sampler pack is a fun treat in the Nov-Dec timeframe.